In just a few weeks many of us will be tucking into delicious Easter eggs, and will indulge in more chocolate than we can imagine. Therefore, in order to balance out the immense sugar intake over the Easter weekend, it could be a good idea to give up the sweet stuff in the weeks leading up to April 21st. It is not a surprise to find out most of us eat far too much sugar these days, and the National Institute of Health (NIH) believes American adults get 15 per cent of their daily calories from just sugar, according to Medical News Today. However, with excessive sugar intake associated with obesity, type 2 diabetes, heart disease, chronic inflammation, dental problems, high blood pressure, cholesterol, and fatty liver disease, it is essential to reduce the amount of sugar eaten every day. The NHS recommends adults eat 30g of free sugars a day, but as this just amounts to seven sugar cubes, it is easy to see how many of us consume far more than this. Indeed, a can of cola alone can contain as much as nine sugar cubes – and this is before accounting for sugars in processed foods, carbohydrates, and spreads. As well avoiding the mid-afternoon sweets, cakes and biscuits, you need to be aware of hidden sugars in other foods. 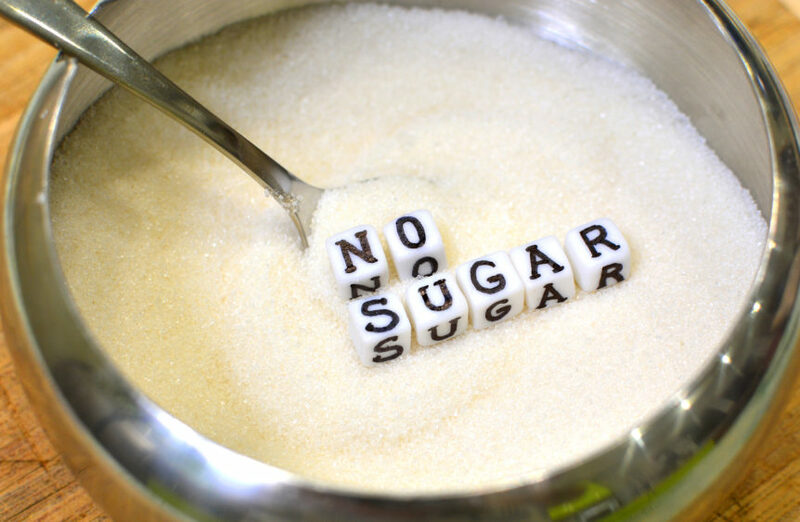 It is important to read labels carefully and identify different names for sugar, including sucrose, lactose, glucose or fructose. You are likely to find products such as pasta sauces, breakfast cereals, granola bars, condiments and even milk have high levels of sugar in, in addition to obvious culprits like fizzy drinks, squash and fruit juice. Depending on how serious you take your sugar-free diet, you might want to give up simple carbohydrates for a while. These carbs are broken down quickly in the body, which causes blood sugar levels to rise. Instead of tucking into white pasta, white rice, white flour and white bread, it is a better idea to opt for wholegrain options. You could also replace simple carbs with foods that have higher protein contents, such as meat, cheese, chicken, pulses, fish and eggs. These will leave you feeling fuller for longer without experiencing the spike in sugar levels. While you might have started your sugar-free diet to balance out the amount of chocolate you are likely to be consuming at Easter, you could find you enjoy several benefits from ditching your treats. Some people have an addiction to sugar, so by breaking this habit, you may realise you no longer crave it and your energy levels become more balanced throughout the day. That is why many people, including famous sugar-free follower Davina McCall, claim ditching sugar has “had an impact on my energy levels”. She also claimed “my skin looks loads better”, while it is thought to improve mood swings, reduce inflammation and alleviate digestive complaints as well. One of the hardest parts of sticking to a restrictive diet is not being to eat out, but if you’re looking for healthy snacks and meals, get in touch with our catering experts in Yorkshire and see what we can do for you.